There are no user reviews for NEXCESS NET. Provides web hosting solutions for websites including shared and reseller web hosting to virtual private servers. Based in Ann Arbor, Michigan, United States. 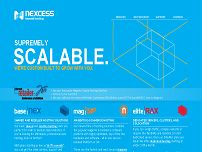 Nexcess was founded in 2000 as the proverbial "two guys in a garage" with aspirations of providing good, quality hosting services to the masses. The masses, in the beginning, were simply friends, family and any other people we could convince into using our fledgling service. It was very slow going in the beginning which gave us time to think… and write software. The InterWorx™ brand of web hosting control panel software was actually born, in part, out of our early days of tinkering. InterWorx™ was spun off in 2005 but we still take time to tinker during the slower days, even if they are fewer in number. "Beyond Hosting - You focus on your site's content and we'll focus on keeping it online - big, small or in between." We host websites that range from solo blogs and small eCommerce stores to huge WordPress publications and Magento stores with stratospheric levels of traffic. We can accommodate such a diverse range of hosting requirements because of the different infrastructure configurations we offer. In this article, I’d like to discuss how we are able to host… Continue reading ? Twice a year, WordPress’s developers release a beta for the upcoming version of everyone’s favorite content management system. The most recent beta landed in early March, and is ready for testing by WordPress site owners who want to get a preview of the new features and test their plugins and themes before the final release,… Continue reading ? One of the most challenging aspects of building an effective eCommerce advertising strategy is deciding which regions to target. A new tool from Google — Google Shopping Insights — aims to make it easier for eCommerce retailers to target advertising to markets with higher volumes of interest in specific products. Google Shopping Insights — currently… Continue reading ? The number of users who access sites on mobile devices has increased dramatically over the last few years, both as an absolute number and as a proportion of site traffic. In many areas of the web, mobile users now outnumber those who visit sites from desktop or laptop machines. The predominance of smaller screens has… Continue reading ? With political season well underway, what’s the only thing that Donald Trump and President Obama agree on? ExpressionEngine. That’s right. ExpressionEngine. Feel free to check out the rest of the top twenty EE sites in the roundup below. If you were unable to attend the first WordPress REST API conference, we’ve included the review of… Continue reading ? A few years ago, I had all but given up on email newsletters. My inbox was full of junk newsletters stuffed with thin content and promotional garbage that didn’t provide a shred of value. I spent more time deleting newsletters than reading them. But over the last couple of years, email newsletters have become genuinely… Continue reading ? Last week, Google and Red Hat revealed they had discovered a serious vulnerability in the GNU C Library, a collection of software present on almost all Linux servers and used by many Linux-based applications. The vast majority of web hosting platforms — including ours — run on Linux. I’d like to take a quick look… Continue reading ? Medium is a powerhouse publishing platform from the founder of Blogger and co-founder and former CEO of Twitter — Evan Williams. It offers push-button publishing, a beautiful reading experience, and a social graph that makes promoting content relatively straightforward. Williams has not been shy about his intentions for Medium: “The idea won’t be to start… Continue reading ? For the last couple of years there has been a heated debate between supporters of native apps and those who are strongly in favor of the mobile web. Native app proponents argue that the mobile web will never provide the level of device-integration and performance that a native app is capable of. Mobile web proponents… Continue reading ? What’s slowing down your website? By now, you’ve probably heard statistics that show that website loading speeds affect conversion rates of website visitors into leads, and into eCommerce sales. Loading speeds can definitely have an impact on your bottom line, especially for mobile users, whose connection speeds are more likely limited. Speeds can also impact your ability to cost effectively… Continue reading ? When you search Google for a topic with relevance to current affairs, you may notice a section on the results page called “In The News”. Unlike some of the other search page sections, the news section doesn’t come from Google’s main index, but from Google News — an algorithmic curation of new stories that have… Continue reading ? For a particular type of morally bankrupt individual, the idea of ransomware must appear to be a stroke of brilliance. For everyone else, ransomware is the stuff of nightmares. That goes double for eCommerce merchants, for whom their store and its data is their business and livelihood. The loss of data to a ransomware attack… Continue reading ? WordPress started life as a blogging engine. Today’s WordPress retains many of the traits of its first years, even though it has long since shaken off its image as “just a blogging engine”. Now supporting a quarter of the top million sites on the web, WordPress is a uniquely powerful and flexible publishing tool. Nevertheless,… Continue reading ? A brute force attack is the least sophisticated technique online criminals have to compromise WordPress sites. It doesn’t take advantage of obscure coding errors or advanced social engineering techniques. Rather, a brute force attacker simply tries lots of username and password combinations until they find one that works. The execution may be more or less… Continue reading ? There are many reasons a WordPress user might want to create a WordPress installation on their local machine. Testing plugins and themes before deploying them on a live site Creating a dev site for theme development Running WordPress Betas to try new features Installing WordPress on your desktop or laptop can be a complicated procedure,… Continue reading ? Does Your Company Own Its Domain Names? For modern businesses, domain names are an essential part of branding. Most consumers are aware of businesses through their domain name, and all companies with a presence online invest a big chunk of their marketing budget promoting their site. That makes domains valuable. They’re the rare commodity that can be had for a nominal cost,… Continue reading ? Commercial blogging as part of a content marketing strategy is not easy. It’s not coal mining, but nor is it a walk in the park. It’s particularly difficult for business owners who have been told that blogging will increase traffic to their site and visibility in social media, but who have no experience of professional… Continue reading ? The short answer: probably, but not for the reasons many still believe. Not any more, at least. “Once upon a time” in eCommerce equals about 18 to 24 months. Once up a time, if your site needed a SSL certificate to process credit card transactions, you needed a dedicated IP address. Once upon a time,… Continue reading ? 2015 was a big year. We were lucky enough to see the long-awaited releases of Magento 2 and ExpressionEngine 3, as well as numerous WordPress releases. More on that below. So for this month’s roundup, we included some of the best recent stories as well as a few articles and bits of news that shaped… Continue reading ?